If anyone tells you that Slovakia doesn’t have a sea, he is only partly right. We are of course far from the real sea with salt water but we have quite a few of our own freshwater seas of our own – so don’t worry about escaping from the August summer heat. There are enough places to swim, windsurf, ride a water-scooter, or sail. 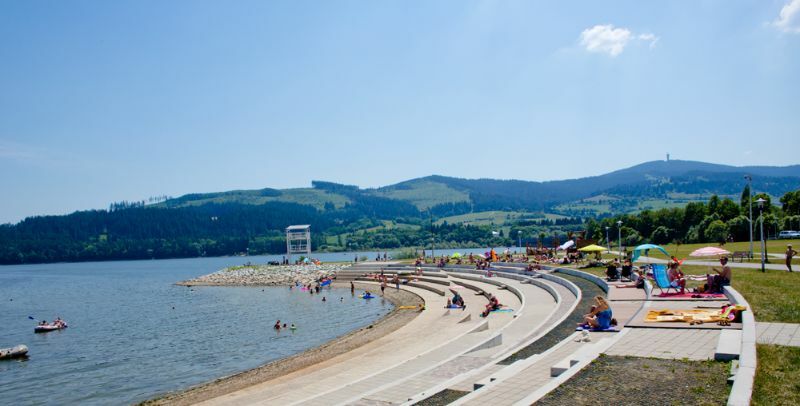 The biggest lake for summer sports in Slovakia is Oravská priehrada (Orava dam) with 35 km2 of water surface near the city of Námestovo, close to our northern borders. It was so obvious a place for a dam that the first plans were drawn up in 1730. Actual construction took place from 1941 to 1954. From then on many recreational improvements were made in the area. In contrast to the rather colder waters of Oravská priehrada are those held by the second largest dam Zemplínska šírava (Zemplin Plains Dam) in our eastern lowlands. 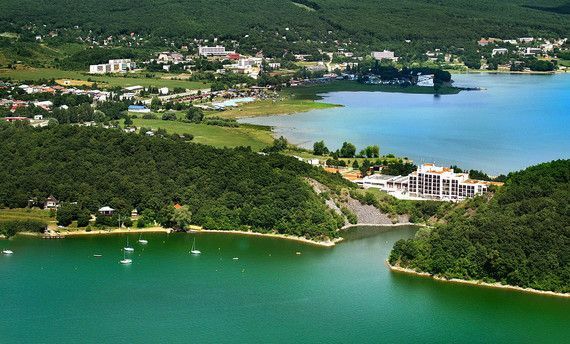 Here you will find 7 different tourist resorts around a lake that is 11 kilometers long and 3,5 kilometers wide with average depth of 9,5 meters. Good for fishing too. The third largest dam in Slovakia, Liptovská Mara, you can find very easily. 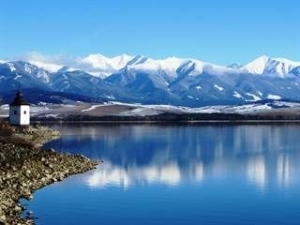 It is close to the highway under the slopes of the High Tatras. If you do not wish to or cannot travel outside the capital city of Bratislava, go to Zlaté piesky (Golden Sands). Here you will find a trainer centre for surfing. Here You will company of nice young people not only from Slovakia. You can also play miniature golf, table tennis, tennis, football and volleyball. This place with easy access by tram, has also a vivid nightlife with discotheques and concerts of pop concerts. A very popular drink for Friday night fever here is red wine with kofola, a local type of cola invented in Slovakia in the 1980s. Some claim that it has a better and more natural taste than Coca-Cola and has a better balance of sweetness than Pepsi-Cola. In Slovakia we have a variety of red wines. One of them, Račianska Frankovka, originated in Bratislava where vineyards cover the slopes of the Malé Karpaty hills at the northern edge of the city. But you may enjoy as well Frankova modrá and of course Cabernet Sauvignon that, especially as produced in Nitra, you may find in World encyclopedia of wines. There are also plenty of ordinary red wines that together with kofola may refresh you in hot August late evening. In the past kofola on tap was a very popular drink and together with bread roll “bosniak” it made a great cheap meal favoured by young people. By the way, bosniak (named after the country of Bosnia from where it probably originated) is the biggest salty cake you may ever see. Estimate its size by yourself – in a good restaurant you may receive a large helping of soup poured into a hollowed-out bosniak. 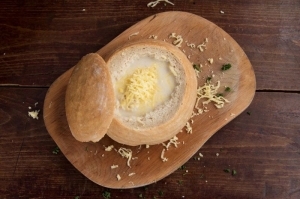 And of course you can eat the bosniak when you finish the soup. Speaking about meals – did you ever eat “granadír”? Granadír’s full name “granadír marš” (march of Grenadiers) probably originated from Napoleon’s soldiers’ march towards the city in 1805 when the historic “Peace treaty of Pressburg” was signed after the Battle of Austerlitz. (Pressburg is now Bratislava and Austerlitz is Slavkov in Morava, Czech Republic, by the way). And “granadír“ is truly a simple meal like for soldiers. 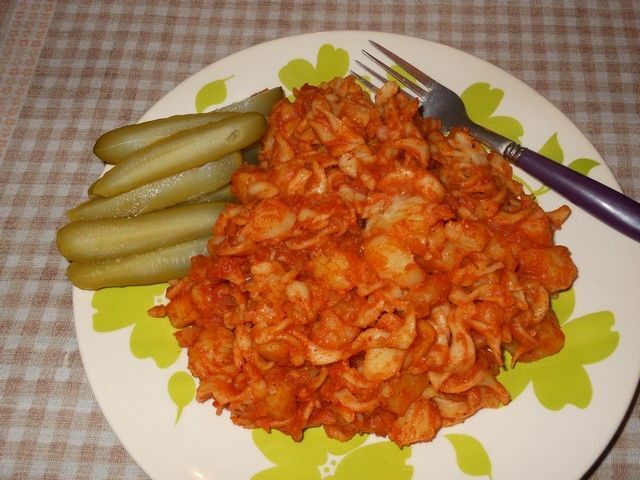 But it is very tasty and some Bratislava grandmothers were renowned for preparing it from boiled potatoes, square pieces of pasta, onions and red paprika. It goes well with especially selected small cucumbers. And August is also the time when red currants are harvested as a source for another specialty of Western parts of the city – Karlova Ves and Devín. It is another red wine, this one called “ríbezlák” (red-currant wine). I remember when people made it at home and as university students we had a “duty” to go to the cellar of one of our schoolmate’s father to empty a small barrel of old “ríbezlák” to make way for the new vintage. I cannot recommend you do the same, as it is sweet and a bit heavy. I propose it as an aperitif for a true Bratislava lunch, with the soup in bosniak and granadír with cucumbers afterward. And don’t forget, kofola tastes good by itself during the hot August days and perhaps even better with red wine in the evening.